What is the difference in Custom Series and Pro Series lamps? SunMaster lamps come in two basic Series: Custom and Pro. The main difference is the rated lamp life. Generally, the Custom Series lamps (like the Custom Bronzer and Custom Plus) are rated for 800 hours, while the Face and Body lamps are actually rated for just over 1000. The Pro Plus, Pro Bronzer and Pro Twister are rated for over 1200 hours. The quality is the same for both lamps: 100% premium. The main advantage is that home tanning bed owners can choose the Custom Series, which cost less, and get the exact same results. Salon owners, however, need the longer life that the Pro Series offers because the beds are used many times per day. The Pro Series generally cost $2 more for the same UVB ratio, but offer up to 50% more life, so they actually cost significantly LESS to operate. Which lamps is best for you depends on how much use they get. The average home tanning bed can get 3 to 5 years out of a set of 800 hour lamps, but if your home bed is used a few times per day, then the Pro Series will cost you less in the long run. Also, if you need F59 sized lamps, these are only available in the Pro Plus models, so that may dictate your choice as well. We developed a special help section to help you determine the correct size. Click here to open a new window with the information. Over 98% of the time, you can determine the correct lamp in less than two minutes. This is the most confusing term when buying lamps, partially because it is the most used (and abused) term. This is the 5% or 6.5% rating you see on lamps. First of all, a higher number does not mean a "better" lamp. The UV rating is a RATIO based number of the UVB versus UVA. UVB burns you but stimulates melanin development. UVA is what actually does the tanning. A 5% lamp is 5% UVB, 95% UVA. A 6.5% lamp is 93.5% UVA. This number has nothing to do with the TOTAL amount of UV, just the ratio. No. Just because your tanning bed came with Wolff lamps as EOM equipment, you can choose to use a different lamp as a replacement. We offer several brands that are compatable, and even a few Wolff brand replacements if you would prefer to stay with the same name brand. What is commonly called a "hotter" lamp is one that has more UVB and less UVA. These lamps are quite popular, but not the best combination for all tanners. Most 20 minute tanning beds come standard with lamps that are between 4.2% and 5% UVB. A lamp with 5.5% or higher UVB would be considered to be a "hotter" lamp. 6.5% to 7.5% are typical, with UVB ratings as high as 8.5% to 9.5% also available. These hotter lamps can help stimulate the development of melanin in your skin, but are more likely to cause sunburn in your tanning bed. Remember, the "hotter" the lamp is, the lower the UVA. This means you will hit a tanning peak sooner. This example graph demontrates how you get a quicker jump start on your tan with the higher UVB lamps, but after 4 weeks, they won't get you quite as tan as a 5% lamp or a bronzing lamp (4% or less). Patience is rewarded when you are selecting a tanning lamp. Most true bronzing lamps cost more, but if your goal is to get the darkest tan, they are the better investment, since you will achieve a better tan in the long run, with less sessions. While this graph is a bit of an oversimplification, it does demonstrate the long term "tanability" of the different types of lamps. If you have normal skin, a lamp with a UVB rating of 4.2% to 5% will give you the best results in a 20 minute tanning session. If you are hard to get started with tanning or you are more concerned with tanning FAST than getting the darkest possible tan, then a 6.5% lamp may be a better choice. 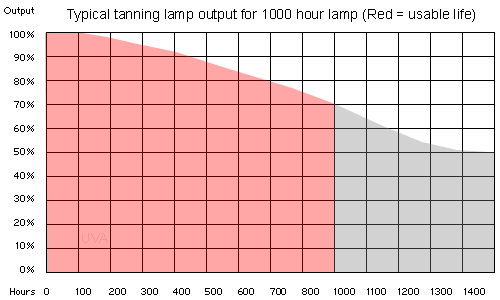 If you tan daily and have a 30 minute timer, and your goal is to get the DARKEST possible tan, even if it takes longer, then you may want to look at lamps with a UVB rating lower than 5%. The higher UVB lamps, with ratings from 5% to 6.5% are the most popular. This is primarily due to many people wanting to get a base tan FAST and more concerned with the speed of the tan, rather than the darkness of the tan. Also, less expensive lamps tend to be more popular than the high priced ones. This is usually true of any product, tanning or not. Another common misconception is that the color of the lamp affects the tanning. UV is what tans you, and it is too high a frequency for you to see. (some birds and insects CAN see UV, but not humans.) The color of the lamp is determined by a mix of phosphors that has NO effect on the tanning. You can take any tanning lamp, and make it glow green, yellow, purple, red, pink, blue or even different colors, and that will not change the tanning in any way. The main purpose of the color is to please the eye and differentiate the lamp from other lamps. That is all. We do not recommend lamps with this high of a UVB rating, as they are better at burning you than tanning you. Remember: When you get more than a little red from tanning, you are actually HURTING your tan. A sunburn will not only cause peeling, but reduce your skins ability to tan for weeks. It is also unhealthy to get a sunburn. We offer these ultra strong lamps to give you a choice, but strongly advise against them. This is highly subjective, and there are as many opinions as there are lamps. All the lamps we offer are heavily tested and are guaranteed to deliver the performance they are designed to give. Even here at our facilities, everyone has a different "favorite", each with their own reasons. We do try to give you some information on the site about which is the most popular with our customers and tanning salons. Bronzing lamps are lower rated UVB lamps that tan you slower, but darker. Many people confuse this term with "hotter" lamps, when in fact, they are the exact opposite types of lamps. Hot lamps tan fast but less dark, bronzing lamps tan slow but darker. Again, this depends on your needs. If you like the results you were getting when your tanning bed was new, then a similar lamp is the best way to go. If you decide to move away from the original types of lamps your bed came with, it is best to make a modest step, rather than a radical jump. Going from a 4.2% lamp to a 9.5% lamp is not likely to give you the results you were expecting. Most lamps are rated for 1000 hours, but we recommend you change them in the 600 to 800 hour range for best results. At 700 hours, this equals 2100 tanning sessions of 20 full minutes. If you use the tanning bed ONE time per day, this is almost 6 years. Most people tan seasonally, but have more than one person tanning on the bed, so on average this is about every 3 to 5 years, depending upon usage. Several factors figure into the price of the lamp. Shipping (especially if it is made in Europe), the different phosphors, the quality of the lamp, and the quantity the seller purchases. For instance, we can sell certain brands much cheaper because we use them as OEM equipment on our tanning beds. This means we buy tens of thousands of them at a time, and get a better price, so we pass the savings on to you. Price alone is not the determining factor when it comes to quality. All lamps are guaranteed to arrive in perfect condition and come with a manufacturer's warranty of 30 days from the date of arrival. If you ever have a problem with lamps you purchased from us, just call us at 1-800-274-1744. Most tanning lamps will actually continue to light up for up to 10,000 hours, but they quit producing significant amounts of UV (the tanning rays) after 1000 hours. You can keep using them, but you will not be getting much of a tan. Those lamps are OEM equipment for tannning beds sold by ETS, Inc. They own the trademark and have demanded that NO ONE sell those lamps except themselves. This means there is no competition, and no incentive for reduced prices. You can call them direct and purchase them for around $20 or more each, or you can instead purchase replacement lamps here that start at $9.99. These replacement lamps are FDA recognized equivelents. Actually, we carry dozens more brands than we show on the website. Listing all the brands causes more confusion, so instead we list the best sellers. Odds are, you can use a different lamp than what came as OEM equipment on your bed, and save money. Call us at 1-800-274-1744 and we can special order your existing lamp, or suggest an FDA recognized equivelent. Yes. We have the lamps for EVERY brand of tanning bed. If you don't see your tanning bed listed in the Lamp Wizard, just call us at 1-800-274-1744 and we will source the lamp for you. Be sure to have your tanning bed's make and model, or one of the lamps handy to speed up the process. You CAN, but we recommend against it. It is best to replace all the lamps at one time, but if you MUST replace them in stages, we recommend you replace either the canopy or bench as a whole set. So, if you have a 24 lamp bed, replace the top 12 lamps as a set, then the bottom 12 as a set. Again, it is really best to replace all the lamps at one time. Most tanning salons replace them once a year, which is about every 2 to 3 lamp changes. Home tanning beds may go 5 to 10 years without needing to change them. The main indicator is how fast the lamps start. if you have lamps that are slow to start, lamp starters are usually the cause. You don't have to replace all the lamp starters at one time, but since it only costs around $50 to replace all the starters in a 24 lamp bed, its a good idea to replace them each time you change the lamps. The electronic starters are a good option as well. They cost about twice as much, but are designed to last forever. Sure, but its not always a good idea. This is why we developed the Lamp Kits. They mix different lamps, such as Brilliance and Dual Sun, but these lamps are all tested together to insure even tanning (they use the same internal phosphors in the 5% section). You may not get the results you wanted by mixing lamp types that are untested, and we can't offer support for untested combinations. Because it is the cheapest way to boost the performance of your tanning bed. For around $20, you can easily increase the output of your tanning bed from 5% to 20% or MORE. Your acrylics naturally build up a layer with use. This layer is invisible to the eye, but it blocks UV. Your reflectors and lamps also get a thin layer of dust on them, caused by the cooling fans on the bed bringing in air from the room. Cleaning your bed every year and using this kit (which lasts 3 to 4 cleanings) is the easiest way to keep your tanning bed in top performing condition. The kit has instructions for use, and some other nice freebies as well. Inside the lamp, nothing, but they connect to your tanning bed in very different ways. RDC (Recessed Dual Connector) lamps "spring" in and out, where Bi Pin lamps have two pins that slide into the lamp holder, and you twist the lamp into place, much like a 4 foot office type lamp. There are no advantages in tanning with either lamp. RDC lamp holders are much more expensive than Bi Pin lamp holders, so they are much less common. RDC lamps are usually 72 or 73 inches long (and some rare 60 and 74 inch varieties) where Bi Pin lamps are usually 71 or 59 inches long. RDC are actually just Bi Pin lamps, with special adapters pushed onto the pins. Call us at 1-800-274-1744 anytime during business hours and speak to someone in the Lamps Dept. If you are still confused and not sure which type of lamp, the best thing to do is stick with a 5% to 6.5% UVB lamp. Most tanning beds come standard with a similar lamp, and millions have used them for years. Check out our "most popular" lamps area to see which lamps our customers are choosing most frequently. Keep in mind that the easiest way to increase the tanning power of your tanning bed is to clean it regularly. Purchasing a Tanning Bed Rebuild Kit (around $28 here) is a great investment to getting a 5% to 20% boost, or more. I have personally seen as high as 40% boost in some commercial tanning systems, with a good internal cleaning and stripping of the acrylics. It is also very cost effective.